Center Samuel Bennett is No. 1 on NHL Central Scouting's midterm ranking of the top North American skaters for the 2014 NHL Draft, but that doesn't mean he's the favorite to be in that spot when the final rankings are released in April. At least that's what Director of Central Scouting Dan Marr has said since the group's first numerical list was released Monday. "The meetings weren't easy, but once we got the discussion flowing with what everyone was saying and what everyone saw in the players and within the games, it wasn't tough," Marr said. "Some might have had an idea what the list might turn out to be prior to walking into the meetings, but once everyone saw it up on the board and you took everything into consideration, everyone was good with the order." Bennett was a worthy candidate to top the list in January. His play in the first half of the season for the Kingston Frontenacs of the Ontario Hockey League has been on an increasingly steady incline. "The one thing it came down to is that when talking about a player who can be a difference-maker, a game-changer, right now Sam Bennett is proving to be that guy," Marr said. "That's why we consider him to be the No. 1 pick overall. "The fact is we like them all. Everyone had a different player as the top guy. But as a group we went through it all, discussed it, and this is what we've presented to the hockey world." Rounding out the top 10 among North American skaters were No. 2 Leon Draisaitl of the Prince Albert Raiders (Western Hockey League); No. 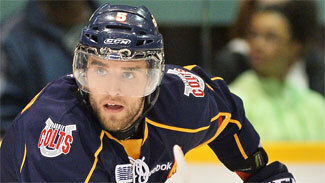 3 Aaron Ekblad of the Barrie Colts (Ontario Hockey League); No. 4 Sam Reinhart of the Kootenay Ice (WHL); No. 5 Michael Dal Colle of the Oshawa Generals (OHL); No. 6 Haydn Fleury of the Red Deer Rebels (WHL); No. 7 Nicholas Ritchie of the Peterborough Petes (OHL); No. 8 Brendan Perlini of the Niagara IceDogs (OHL); No. 9 Jake Virtanen of the Calgary Hitmen (WHL); No. 10 Anthony DeAngelo of the Sarnia Sting (OHL). "Nobody would be surprised if we said five years down the road that Dal Colle would be the best player," Marr said. "He's actually in the mix for consideration over the second half. As far as consistency goes he might be the most consistent player among the top five. He's a power forward in the making." As consistent as Dal Colle has been, Draisaitl has been a leader and fantastic competitor for the Raiders; Ekblad has been a defensive mainstay for the Colts; and Reinhart arguably has the highest hockey IQ of any player on the board. The one thing they have in common is all are in the running for the top spot in the final ranking. For whatever the reason, however, defensemen haven't been a popular choice among those teams selecting first in the NHL draft. The last team to choose a defenseman with the No. 1 pick was the St. Louis Blues in 2006 when they picked Erik Johnson. That could change when the first round of the 2014 draft is held June 27 at Wells Fargo Center in Philadelphia. "It'll be interesting to see the draft tendencies of teams now that a building block like Aaron Ekblad is available; his offensive game is on the upswing, he has a terrific shot, and as he evolves he'll look more and more like a Shea Weber-type," Marr said. "The tendency of late hasn't been to step up for those [defensemen] as it was, say, a decade ago. I don't think it denigrates a player's capability though." At 6-foot-4, 217 pounds, Barrie Colts defenseman Aaron Ekblad immediately captures the eye of any scout in attendance for one of his games in the Ontario Hockey League. He's the top-ranked defenseman on NHL Central Scouting's midterm ranking of North American skaters for the 2014 NHL Draft, and No. 3 among all skaters. Ekblad, who has 14 goals and 31 points in 31 games, played for Canada at the 2014 IIHF World Junior Championship and impressed the coaching staff to the point he earned top-four ice time at the tournament. Ekblad served as captain for Team Orr at the 2014 BMO CHL/NHL Top Prospects Game on Wednesday. He is captain for Barrie this season. "He's smart and an excellent all-round skater for his size (6-foot-3.5, 216 pounds)," Dan Marr, Director of NHL Central Scouting, said. "He handles and distributes the puck very well in all zones, passes with authority, and possesses an accurate point shot. He's highly consistent and displays strong leadership ability." Ekblad served as captain for first-place Canada at the 2013 Under-18 Memorial of Ivan Hlinka Tournament in August. He was captain of Team Ontario at the 2013 World Under-17 Hockey Challenge and finished as the second-highest scoring defenseman at the tournament with six points (two goals). He was granted exceptional-player status by Hockey Canada and was eligible for the 2011 Ontario Hockey League priority selection as a 15-year-old. He was the first pick of the draft by Barrie and had 10 goals and 29 points in 63 games in 2011-12 to earn OHL Rookie of the Year. NHL player: "I like several different players, whether it's Drew Doughty or Duncan Keith. I like all those established defensemen." Shootout move: "Fake, backhand, forehand." Goal celebration: "I raise my arms in excitement." Then there are the European players who have impressed in recent seasons. "There are a lot more Europeans in the running as a first-round pick," Marr said. "The only anomaly to that is that a majority of [the European players] are already competing in North America. A couple of European players could be taken in the top 10 for sure, including four or five who are already playing in Europe." Central Scouting's ranking of the top international skaters has Kasperi Kapanen of Kalpa in Finland at No. 1, followed by William Nylander of Sodertalje in Sweden; Adrian Kempe of Modo in Sweden; David Pastrnak of Sodertalje; and No. 5 Jakub Vrana of Linkoping in Sweden. "The great thing about Central Scouting is you have eight guys voting and everyone had a different list," Central Scouting's David Gregory said. "It takes debate and we come up with one. It could be different at the end of the year." Though Bennett was unavailable to participate in the 2014 BMO CHL/NHL Top Prospects Game in Calgary after sustaining a lower-body injury, two talented teammates were more than willing to share thoughts on their friend earning the No. 1 ranking on NHL Central Scouting's midterm list. Representing Kingston at the Top Prospects Game were defenseman Roland McKeown, No. 15 on the midterm list, and right wing Spencer Watson (No. 43). "What an experience for him, but he's deserved that spot 100 percent," McKeown said. "He's worked hard and deserves to be there. He's on a 24-game point streak (16 goals, 44 points). What else needs to be said? He's continuing to prove himself as a legitimate contender for the No. 1 pick." Bennett (6-foot-0.25, 178 pounds), who likely will return to the lineup soon, ranks fourth in the Ontario Hockey League with 66 points (26 goals, 40 assists) in 40 games. He leads the team with a plus-26 rating and seven power-play goals. Bennett plays on the top line alongside Watson (23 goals, 43 points) and Henri Ikonen (22 goals, 51 points). "I'm proud of him and everyone on the team is proud of him," Watson said of Bennett. "He deserves it. He's had a great year and he's worked hard. I've played on a line with Bennett for most of the two years that we've been on the team so we have chemistry and know where each other is. That helps all three of us." Watson said that watching Bennett on a daily basis has helped his game. "Anytime you can play with a player like that, it just levels your game and you kind of step up," he said. "You want to play the best with him. He helps raise your game." Sarnia Sting defenseman Anthony DeAngelo was the highest-ranked American-born player on NHL Central Scouting's midterm list of the top draft-eligible skaters in North America, but he was the first New Jersey native to make the cut. DeAngelo, who is No. 10 on the midterm list, was born in Sewell, N.J. He said he got the good news from his father, Lou, when Central Scouting revealed the list Monday morning. "I didn't see the [rankings] at all and my dad sent me a text because I was at the airport and didn't have any Internet access all day," DeAngelo said. "It was a nice honor to be the top American skater. There are a lot of good players in there, so it was cool." DeAngelo, in his third season with the Sting, attended Bunker Hill Middle School in New Jersey. He said many of his friends from elementary school are avid followers on Twitter. "It's awesome," DeAngelo said. "My name was tagged on Twitter by a lot of people from back home in Sewell. People who I haven't seen in years were tweeting about it, and that's cool." DeAngelo, who was one of the final players cut from the United States team that participated in the 2014 IIHF World Junior Championship, leads Ontario Hockey League defensemen with 53 points in 35 games. His 11 goals are tied for third. "He puts so much pressure [on opponents] when carrying the puck up ice," Gregory said. "You don't see his type of attack in a lot of players. I hate comparing guys, but all of a sudden when you have Paul Coffey coming down on you, so much can happen. He plays at a pace that others can't keep up with and his upside translates well to the pro game." DeAngelo has 17 multipoint games this season and ranks second in the OHL with 24 power-play assists. The 5-foot-11, 167-pound right-handed shot is ecstatic the 2014 draft is coming to Philadelphia this June. Sewell is a 20-minute drive across the Delaware River from Philadelphia, his favorite NHL team is the Flyers, and his favorite player is Flyers captain Claude Giroux. DeAngelo is hoping to have a good showing in the second half of the season to move up in the final rankings, which will be released in April. "I don't feel any pressure but I kind of think I want to move up," DeAngelo said. "I'm not really worried about it though. It's all about what happens in June and you have to keep working hard and playing the right way and see what happens." 1. Brayden Point, Moose Jaw Warriors (WHL): The 5-foot-9, 160-pound center brings plenty of speed and skill to the table. In his third season in the Western Hockey League, Point is No. 53 on NHL Central Scouting's midterm list of the top draft-eligible skaters in North America. He leads Moose Jaw with 19 goals and 42 points and is tied for seventh among all WHL players with 10 power-play goals. "What makes him stand out is that he's one of those guys who won't be denied," Director of NHL Central Scouting Dan Marr said. "He has that competitive factor where he can go out there, make a difference and make it at a quick pace." 2. Ryan Foss, Windsor Spitfires (OHL): The 6-3, 183-pound left-shot center has six goals, 11 points and a plus-1 rating as a rookie with the Spitfires. He is No. 99 on Central Scouting's midterm ranking of North American skaters and has improved since the start of the season. "He had to work his way into the lineup so his ice time was limited in some games, but he's earned himself a regular spot and he's shown he has a really good offensive hockey sense with good instincts around the net," Marr said. "He has a good touch around the net but does need to get stronger and learn the game without the puck. But Windsor is giving him an opportunity, working him into the lineup at the right time. They're setting him up for success." 3. Gavin Bayreuther, St. Lawrence University (ECAC): The 6-0.5, 195-pound defenseman is the top collegian on Central Scouting's midterm rankings. The No. 115-rated skater on the North American list has four goals, 16 points and a plus-5 rating as a freshman for the Saints. Bayreuther, a 19-year-old who was passed over in two previous drafts, has three power-play goals and 14 blocked shots. He was named to the United States Hockey League All-Rookie team after finishing the 2012-13 season with the Fargo Force. He had nine goals and 24 assists while helping his team to the Western Conference championship. He began the season with the Cedar Rapids RoughRiders. "From seeing him as a high school player [at Holderness School in New Hampshire] and his progression, he's always had a great sense of the whole game in front of him," Gregory said. "He really manages the ice well all the time. You add to that his skating ability with and without the puck and you have a solid prospect. He's an excellent passer and can quarterback the power play."